When Jessica Marsh learned she had received a Wyoming INBRE Transition Fellowship, she was ecstatic. 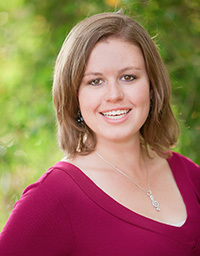 The fellowship allows her to continue to conduct research while studying at the University of Wyoming. Marsh earned her associate of science degree in biology from Laramie County Community College. While there, she learned about the Wyoming INBRE program and worked on an INBRE-funded project. “I would like to thank my mentors at Laramie County Community College, Ami Wangeline and Zac Roehrs, for being so supportive of me and sparking my interest in scientific research,” Marsh says. Marsh is one of nine students from Wyoming’s community colleges who received Wyoming INBRE Transition Fellowships to study and conduct research at UW. Marsh, a zoology major, guided by her faculty mentor Sarah Benson-Amram, an assistant professor in the UW Department of Zoology and Physiology, is researching the behavior and communication of zebra finches. “We hope to identify an association between the communication skills and personalities of mated and non-mated pairs of zebra finches,” Marsh says.